The cast of Pericles (L-R): Gavin McLean, Jennifer Crooks, Tyler Dobies, and Laura Lee Caudill, in a performance this summer at High Point Commons. Photo by Ken Holmes. We’re halfway through our season of Shakespeare! There are just three weeks left to see our four touring shows: Cymbeline, directed by Vince Brady, The Merry Wives of Windsor, directed by Daniel Wood, and Backyard Bard versions of Pericles and Twelfth Night, directed by Ken Holmes. Audience response has been lovely; you don’t want to miss any of these shows. 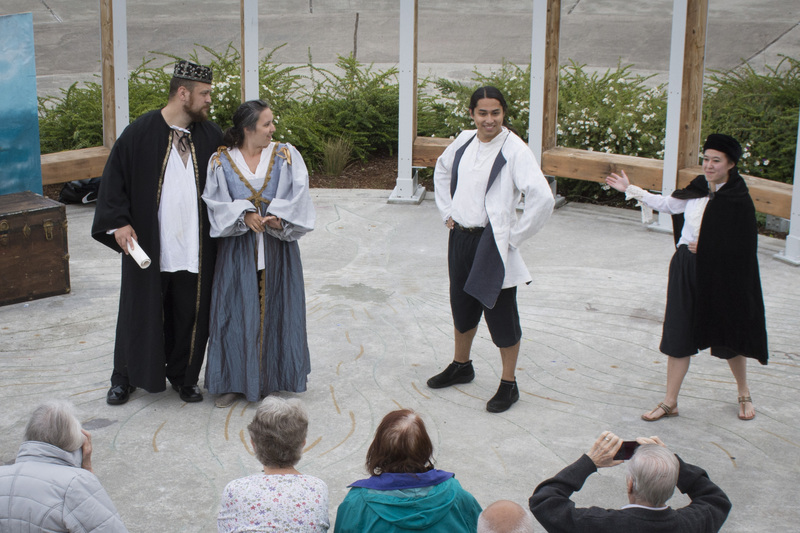 Check out our calendar for times and dates of plays in a park near you. Remember, GreenStage plays are always FREE; we gratefully accept donations.